G3YNH: Digital Readout & All-Mode Adapter for RAcal RA17, part 5. The circuit of the power supply is included for completeness. A thorough modernisation is in order; especially the replacement of the discrete 12V regulator with an IC offering short-circuit protection, such as the LM317. The capacitor marked * is included to give a very low level of hum on the 12V line (as required by the AM and FM detectors), a similar hum reducing measure being possible when using an LM317. Note that the audio output stage is fed with raw DC straight from the rectifier. This is done because the AF output IC used has good supply rejection and works best at higher voltages; and because AF output stages in general cause fast load variations and are best not connected to the same supply as oscillators, etc. A supply of around 175 - 190V is suitable for the GN6 (ZM1080) nixie tubes used; but supplies with high internal resistance, which float up beyond 200V when off-load, are not recommended. When the adapter is first switched on, and the 1MHz input is not yet available, the display register may contain invalid digits (ie., Hex A-F) and the corresponding tubes will be blank. It is in this state that the 74141 output transistors are most likely to suffer collector-emitter breakdown. In the original adapter, the nixie HT supply is obtained from a nominally 125 - 0 - 125 V transformer winding, giving a reasonably load-invariant 180V (176 - 194V). If a suitable transformer is unavailable, it is perfectly feasible (but not ideal) to take the HT supply from the back panel of the RA17, and regulate it with (for example) a high-voltage series-pass transistor and a 180V Zener diode. More information on operating nixie tubes is given in a separate article. The power supply should be provided with a mains filter, in keeping with modern practice. The author's layout is shown above. Good performance demands structural rigidity, and screening of the counter section to prevent spurious radiation. 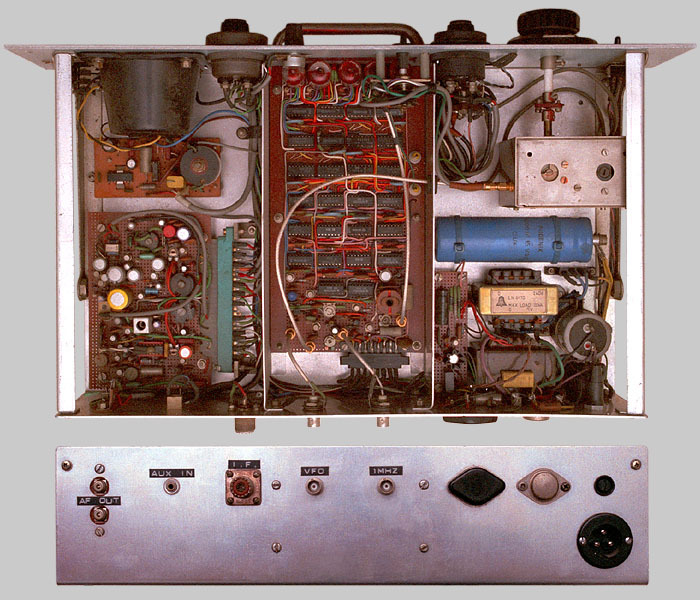 The central counter compartment was originally intended to have a metal cover, but since no spurious signals were ever identified as coming from the logic board, the outer metal 19" rack cabinet was deemed sufficient and a lid was never fitted. Signal cables between the side compartments pass in a conduit underneath the display tubes. The CIO box is screwed to the floor of the chassis and to the side rail for rigidity. The counter board, the demodulator board, and the CIO can all be unplugged and removed for servicing, although in 19 years of use, this has so-far proved unnecessary. Note that the loudspeaker has an infinite-baffle box, which is stuffed with acoustic absorbent - this serves to eliminate the speaker resonances which are the bane of most communications receivers (including the RA17). The baffle box shown is the mid-range compartment from a cheap hi-fi speaker, but a box constructed out of MDF (glued and screwed) will do just as well. The Belling-Lee mains connector is no longer type-approved, and an IEC connector should be used instead. The T03 5V regulator has no insulating cover because the case is grounded. If modern low power logic ICs are used, a TO220 regulator will suffice. Few problems were experienced in commissioning the prototype adapter, but one which took a while to track down is worthy of note. A broad band of white noise, roughly centred on 25MHz, was heard when the least significant digit of the display was a 0, 9, 5, or 4. The solution was to replace the nixie tube, which was evidently operating as a high-frequency neon relaxation oscillator. The spurious radiation was probably coming from the mains cable, and so the inclusion of a mains filter might also have fixed the problem. Note that, on no account, should capacitors be placed directly from nixie tube anodes to ground, since the tubes will then definitely oscillate. 1) USB and LSB positions on S3 (CIO Mode Switch): Enables quick sideband change. Variable CIO position should be retained since it is useful for evading adjacent channel interference (cf. IF shift) and for listening to wide-band SSB (eg., broadcast feeds). 2) Clarifier (interpolation RX fine tuning): Enables precise frequency measurement and calibration, and makes accurate resolution of SSB easier. 3) Full frequency readout, with interpolation RX under and over-range warnings. Brings ergonomics up to modern standards, and extends receiver coverage to about 32MHz. Warning LEDs are necessary, since the operator will no longer have cause to look at the receiver tuning dials. 4) 1MHz internal reference, with PLL and lock indicator: Eliminates nonsense display at switch on, and facilitates servicing. Makes unit work as a stand-alone DFM if external counter input is implemented. 5) Reversed tuning scale mode: Additional counter mode for the RA37 and RA137 LF adapters, and for other applications involving direct input to the 2 to 3 MHz interpolation receiver. RA17 Adapter Mk II: Design considerations. Racal Technical Manuals: RA17L, RA37A, RA137, RA63. Please see also; other articles on the home page.